Dave & Buster’s is now accepting walk-in job applicants at the company’s local hiring location, Hilton Garden Inn, 12600 University Dr. in Fort Myers. Slated to open on April 8 at Bell Tower, Dave & Buster’s has full-time, year-round positions available including servers, kitchen and bus staff. Interested candidates may complete an online application at DaveandBusters.com/careers, and are welcome to visit the hiring location Monday through Saturday from 9 a.m. to 7 p.m. through March 23. The new Dave & Buster’s location will feature 40,000 square feet of entertainment including chef-crafted food, inventive drinks, hundreds of the newest arcade games and the state-of-the-art D&B Sports Bar filled with dozens of HDTVs. The lively environment also provides the perfect setting for corporate and group events. 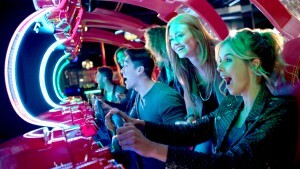 Dave & Buster’s Entertainment Inc. (NASDAQ: PLAY), headquartered in Dallas, TX, operates 124 high-volume restaurant/entertainment complexes throughout North America. The exciting environment of Dave & Buster’s also provides an impressive selection of high-quality food and beverage items, combined with the latest games and attractions. Guests can watch sporting events in the D&B Sports Bar and play state-of-the-art simulators and games of skill they can’t play anywhere else. For more information, visit www.daveandbusters.com.